The Houston Independent School District announced on Monday with the Houston Public Library that every HISD student can now access numerous library resources at school and home through a new virtual library card known as the Learning Link. This entry was posted in Elementary Schools, High Schools, Literacy, Middle Schools and tagged C. Martinez ES, Ketelsen ES, Literacy By 3, Literacy in the Middle, Marshall MS, Northside HS, Sherman ES on October 3, 2016 by HISD Communications. The Texas Education Agency on Tuesday awarded the Houston Independent School District a $9.2 million grant to enhance its early childhood education program. HISD is among 578 school systems across Texas to be awarded a grant as part of Gov. Greg Abbott’s high-quality prekindergarten initiative. The $116 million grant program allows districts and charters to receive funding for qualifying pre-K students in addition to the half-day Foundation School Program funding that is already received for each eligible pre-K student. To receive the grant funding, a district or charter must meet certain enhanced quality standards related to curriculum, teacher qualifications, academic performance, and family engagement. This entry was posted in Early Education, Elementary Schools, Literacy, News, Preschool and tagged Literacy By 3, pre-k, Texas Education Agency on July 6, 2016 by HISD Communications. 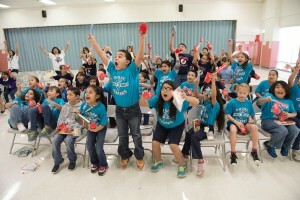 Carrillo Elementary School students learn they are in the lead for the Read to the Final Four challenge in November 2015. 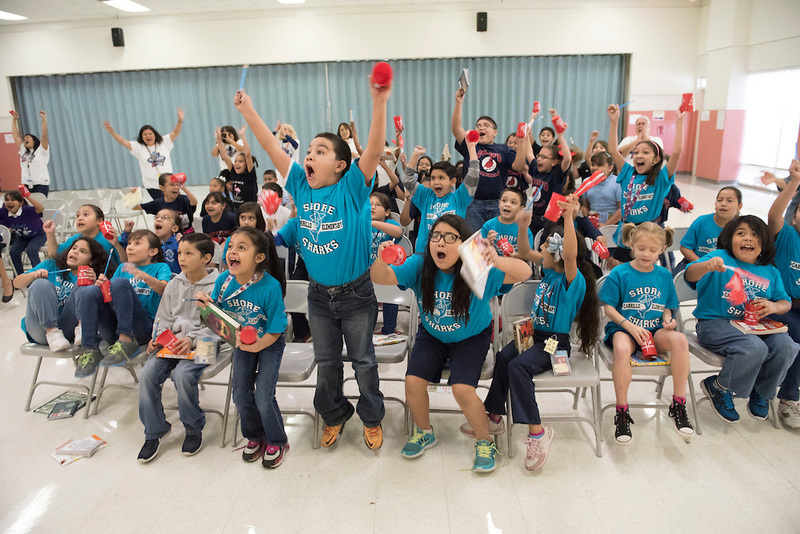 Nearly 10,000 HISD elementary school students will fill NRG Stadium (Reliant Parkway, 77054) on Friday, April 1 for the district’s announcement of the winner of the NCAA Team Works Read to the Final Four Literacy Program at Reese’s Final Four Friday event. The program begins at 11 a.m., but prior to that, Waltrip HS’s band will play as students arrive, and Atherton ES’s drum line will perform before the announcement of the winning school at 11:40 a.m., which will receive a $5,000 cash prize, Final Four trophy, and campus celebration. The final four elementary schools in the competition are Browning, Carrillo, Dogan, and Janowski. Additionally, the top readers from each of the 68 schools will receive a bike from CYCLE. Attendees are welcome to stay for the remainder of the day and watch special practice games and tributes. The day’s activities are free and open to the public, including parking in the stadium’s Blue Lot beginning at 9 a.m. Anything brought into the stadium during all Final Four events must be in a clear bag, due to security. Some 125,000 clear bags are being given away at Houston hotels and the George R. Brown Convention Center, as well as on METRORail platforms. Find full details here. This entry was posted in Achievement/Recognition, District I - Elizabeth Santos, District II - Rhonda Skillern Jones, District IX - Wanda Adams, District VIII - Diana Dávila, Literacy and tagged Atherton ES, Browning ES, Carrillo ES, Dogan ES, Houston Public Library, Janowski ES, Literacy By 3, NCAA, Read to the Final Four, University of Houston, Waltrip HS on March 29, 2016 by HISD Communications. The Houston Independent School District this week received its third national Magna Award, an honor designed to recognize school districts and their leaders for taking bold, innovative steps to improve the lives of students and their communities. This entry was posted in Achievement/Recognition, Literacy and tagged Literacy By 3, Read Houston Read on March 11, 2016 by HISD Communications. A generous donation from a community member has led to a unique professional learning opportunity for HISD teacher development specialists and school support officers. Jill Carter’s $5,000 donation was enough to bring noted authors Kylene Beers and Bob Probst to the Hattie Mae White Educational Support Center to host a very unique training centered on literacy. The donation also highlighted the amazing impact donors and the community can have on the education of our city’s students. This entry was posted in Literacy and tagged Bob Probst, Kylene Beers, literacy, Literacy By 3 on January 25, 2016 by HISD Communications. A big part of getting secondary students excited about the idea of reading for pleasure is finding the right incentives. That’s why East Early College High School’s (EECHS) librarian and principal invited popular young adult author Rosemary Clement-Moore to be the keynote speaker at the campus’ second annual Literacy Day celebration on Sept. 25. It’s also why they awarded a free autographed copy of the author’s latest novel to senior Alejandra Guerra, the student who read the most books over the summer. Personalizing instruction will be a key aspect of the support provided to secondary students this fall through HISD’s Literacy By 3 movement. This entry was posted in High Schools, Literacy, News, Special events and tagged East Early College High School, EECHS, literacy, Literacy By 3, Literacy Day on September 29, 2015 by HISD Communications. The Houston Independent School District announced Thursday a partnership with the Houston NCAA Final Four Local Organizing Committee, Houston Public Library and the University of Houston on a bracket-themed reading challenge that encourages students to read at least 30 minutes a day. This entry was posted in District IV - Jolanda Jones, Elementary Schools, Literacy and tagged Blackshear ES, Literacy By 3, NCAA on September 24, 2015 by HISD Communications. About 1,000 new and veteran teachers attended HISD’s ongoing teacher professional development recently, which included a heavy dose of Literacy By 3 training. The sessions were designed to help teachers learn effective methods and classroom management techniques that lead to students reading on level by the third grade. This entry was posted in Elementary Schools, Literacy and tagged global graduate, J.P. Henderson ES, Literacy By 3, Roosevelt ES on August 3, 2015 by HISD Communications. HISD’s Literacy by 3 initiative is getting aid from other Houston sources. The Barbara Bush Houston Literacy Foundation has allied with the Houston Area Urban League to create several summer reading camps at various affordable housing communities in Houston, several of which serve HISD students. This entry was posted in Literacy, Volunteers and partnerships and tagged literacy, Literacy By 3, reading on July 22, 2015 by HISD Communications.